Mr. and Mrs. Boot live here with their children, Poppy and Sam. They have a dog called Rusty, and a cat, Whiskers. Ted works on the farm. He looks after the animals. 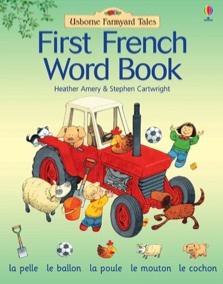 The familiar characters and scenes from Usborne’s enormously popular Farmyard Tales series help to introduce children to their first French words. Containing over 150 French words and many key phrases for young children to learn. With a comprehensive vocabulary list included at the back of the book. Will help young readers to develop picture and word associations.